Bisa is a health application platform that brings a doctor to the patient via a smartphone or web app. 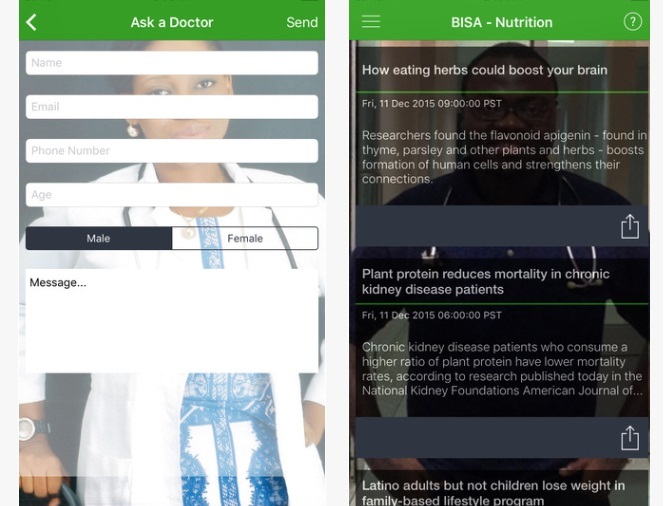 Bisa Health app is a mobile application that allows people with a smartphone interact with medical practitioners. The user does not have to be present physically at a hospital or medical facility. The platform isn’t an alternative to seeking a health treatment. It seeks to bridge the health information gap. This is an advantage to people who need medical care and advice but are not able to visit the hospital for various reasons like; poverty, long queues at the hospital and the fear of stigmatization; especially for people who have symptoms of Sexually Transmitted Diseases(STDs) or diseases in areas that they feel are private or that makes them embarrassed to seek the needed treatment. The Bisa Health App founders believe there is a gap in the healthcare system. Where some people are not able to easily seek medical help when needed and the platform can address this gap. However, healthcare is a basic amenity which everyone should be able to access and Bisa seeks to address this disparity in access to healthcare. The app does not only address the problems of getting medical attention from qualified doctors but it also helps in the prevention and spread of disease by providing up-to-date information on the epidemiology and pathogenesis of common diseases and how to control spread of diseases during outbreaks. Currently the Bisa App is only available for Windows mobile devices from the Windows store. Maybe there’ll be a universal windows app soon? Download the app from the Windows store . You do not need to sign in to ask a question. But you’ll need to provide some details so you can receive a reply to your question. Bisa App is supposed to revolutionize health care in Ghana and Africa. From the comfort of your home, office, etc ask a doctor any question. If you are not sure how to describe an ailment, you can take a picture of the affected skin or medical condition and attach it for better assessment and answering. When you ask a question, you’ll need to give it sometime before you receive a reply. I sent a question in the morning and got a reply in the evening. Also there are other health information’s available in the application that spans various topics. The platform also seeks to provide real time information to people on health issues when there’s an epidemic or outbreak. Give the app a try. Download it, ask a question get a reply and tell us what you think.